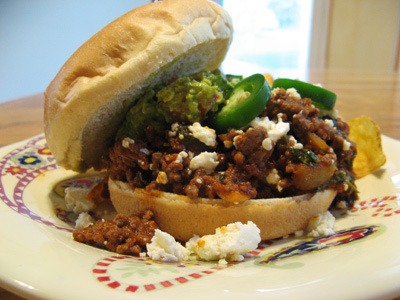 Did any of you notice the Tex Mex Sloppy Joe Sandwich posted by “The Homesick Texan” a few weeks ago? The photo alone made my mouth water. 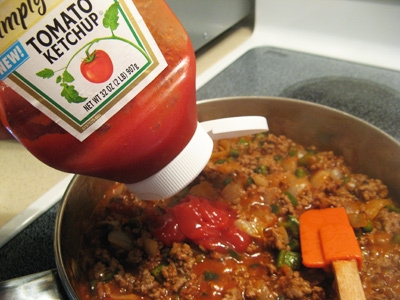 Most Sloppy Joes are ketchup based and sweetened with brown sugar but this Joe was put together with a tomato sauce that was more spicy than sweet. I altered the spices and changed up the chile a bit to give it a more New Mexican flare. I can’t tell you how much we enjoyed the flavors we experienced eating this savory sandwich. 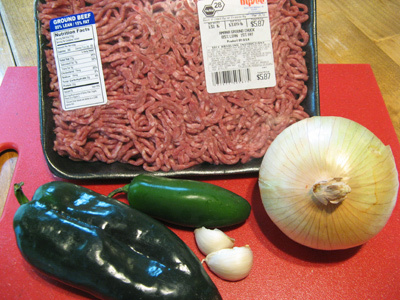 To get started you’ll need 1 1/2 pounds of ground beef, 1 poblano chile 1 jalapeno, 2 cloves garlic and 1/2 sweet onion. The sauce is composed of RoTel original tomato sauce, chicken broth, chipotle puree, paprika, ground ancho chili, Mexican oregano, chile de arbol and worcestershire which I forgot to include in this picture. 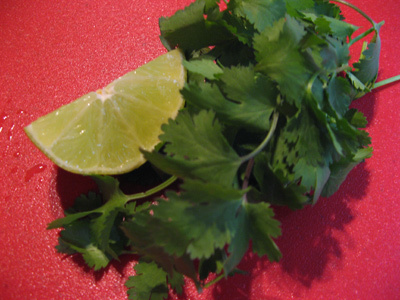 Cut a wedge of lime and some cilantro to add at the end. Set this aside for now. 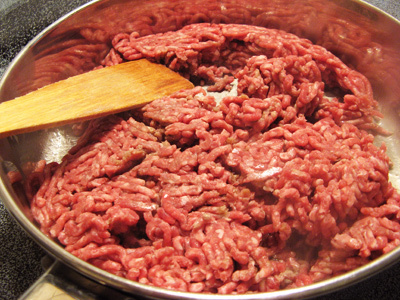 Place your ground beef in a pan over medium high heat to start browning it. 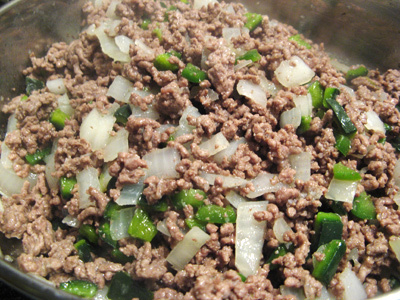 Add in your onion, poblano and jalapeno peppers and cook until they become soft and translucent. Traditionally green bell peppers are part of Sloppy Joe’s but I am not a fan and usually sub in a poblano whenever a recipe calls for green bells. Add your grated garlic last and stir in for a minute more. Time for the sauce. I added 2 cans of RoTel original tomato sauce and a tablespoon of chipotle puree. 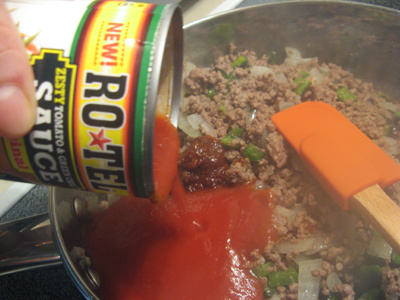 This new RoTel tomato sauce is amazing. Add a couple tablespoons of ketchup and a couple teaspoons of worcestershire sauce. Time to spice it up with some paprika, ancho chile, chile de arbol and Mexican oregano. 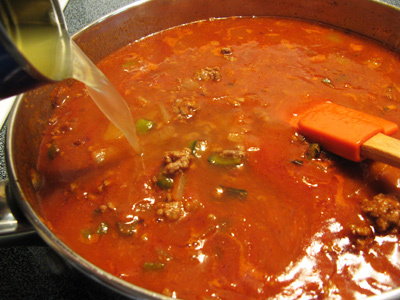 Pour in a can of chicken broth and simmer while all the flavors combine and the liquids cook down. While the meat and sauce are simmering it’s time to get out the cheese. This was my first try with Cotija cheese but I’m a fan now. 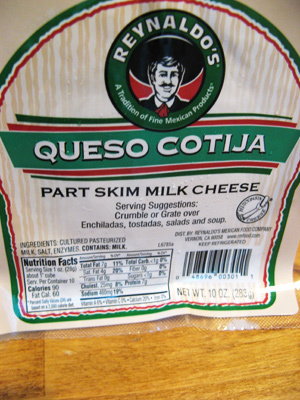 The Cotija cheese was easy to crumble with a fork. 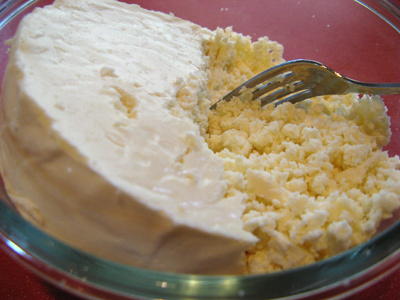 It resembles Feta cheese but is milder in taste. Once the meat has simmered for 15 minutes or so the juices will have cooked down and it’s time to add in the cilantro and lime juice. Stir for a minute or so and salt to taste. Top with guacamole, crumbled Cotija cheese, and some fresh or pickled jalapeno slices. Now that’s one tasty sandwich. Brown ground beef in a large skillet over medium high heat. 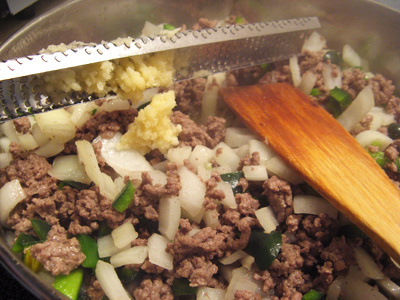 Add diced onion, poblano and jalapeno and continue cooking until vegetables soften and become translucent. Add grated garlic and stir for a minute more. 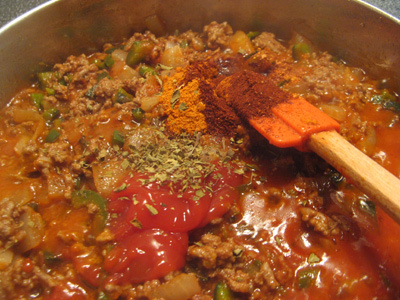 Add chipotle puree**, RoTel tomato sauce, ketchup, worcestershire to meat mixture. Stir in dry spices of paprika, ancho chile, chile de arbol and Mexican oregano. Pour in the can of chicken broth, turn down the heat and simmer for 15 minutes. 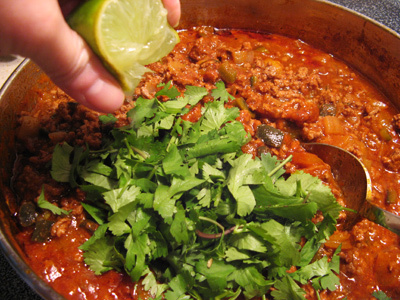 Stir in cilantro and lime juice. Salt to taste. 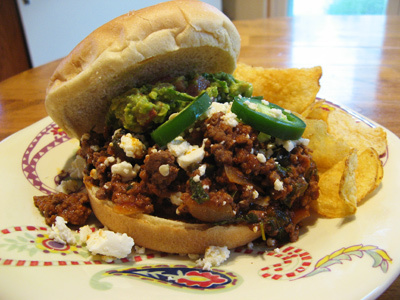 Serve on buns and top with guacamole, crumbled Cotija cheese, and fresh or pickled jalapeno slices. 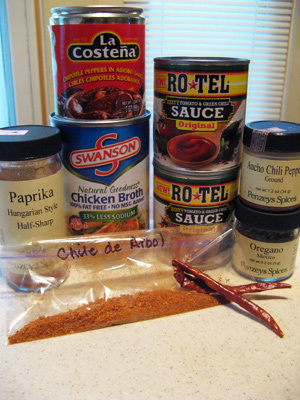 **To make Chipotle puree, pour can of Chipotle en Adobo into a food processor and pulse until well blended. Place contents into a snack size zip lock bag, roll into a rectangle and place into the freezer. A 1/2 inch slice of the frozen chipotlee puree will equal about 1 tablespoon. Oh my goodness. Pure spicy awesomeness on a bun. Do you know how many of your recipes I have pinned to my pinterest boards? If you saw a spike in your stats last week that was me going through your *entire* blog. Now I have another one to pin and try! Do you have a vacancy next door? Need any more kids? We’re kind of grown but are housebroken and are available for adoption, lol!! I can’t wait to put this one in front of Mr. Foodie! I do have a question though…I don’t have Chile de Arbol but have several other varieties of chile’s both ground and whole. Is it a hot (spicy) chile or a warm, smokey chile? Can you recommend a substitution? Actually the house next door is on the market so come on over, we’d have a blast cookin and eatin. The Chile de Arbol, it is a skinny long chile, fairly hot, not smoky and used in a lot of Asian dishes. Cayenne or Piquin chile would work fine as a substitute.